Chicken Cacciatore is a fantastic weeknight family meal that tastes like you’ve been cooking in the kitchen all day but is so quick to throw together! 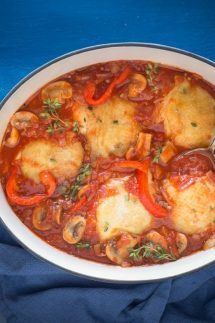 Chicken Cacciatore sounds super fancy but it’s really just a braised chicken stew cooked in a tomato sauce with onions, garlic, white wine, mushrooms and bell peppers. You can make it on the stove top, baked in the oven, or in your slow cooker. I’ve got you covered with step by step instructions for all those options so you can cook it whatever way you prefer. What are the origins of Chicken Cacciatore? ‘Cacciatore’ means “hunter” in Italian and so of course this simple chicken stew hails from Italy. It’s thought that this was originally a dish that hunters ate while out hunting wild animals and needed an easy filling stew that could be cooked in the great outdoors and would keep for several days. Some have suggested that between the 14th and 16th centuries Chicken Caccaiatore was not made with chicken at all, but with rabbit or other wild game, which seems much more plausible. It’s also thought that tomatoes were not an original part of the stew as they were not introduced into the New World much later. 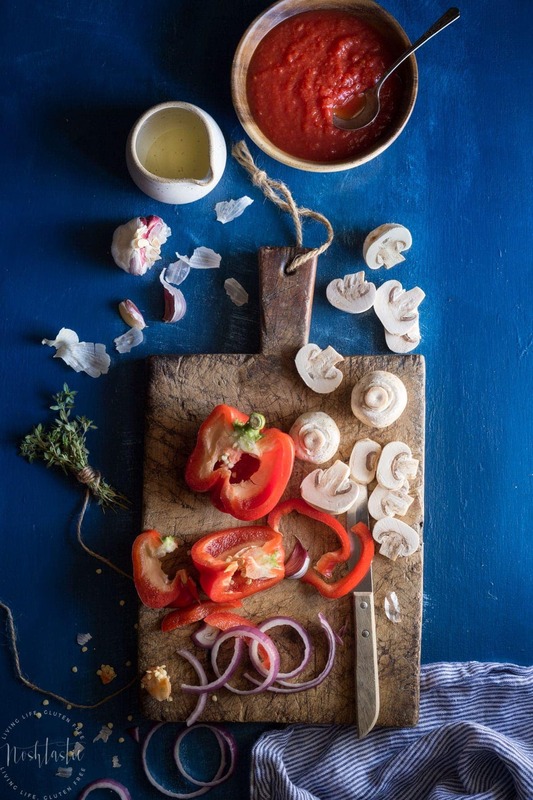 Please use fresh herbs for this recipe instead of dried, it makes a huge difference in the finished flavor of the sauce and is totally worth it in my opinion. I like to bake it in a Dutch Oven with the lid off, this helps to keep the skin of the chicken nice and crispy! Let me plead with you to use real dry white wine and not cooking wine from the grocery store, if you can’t drink the wine then don’t use it to cook with! 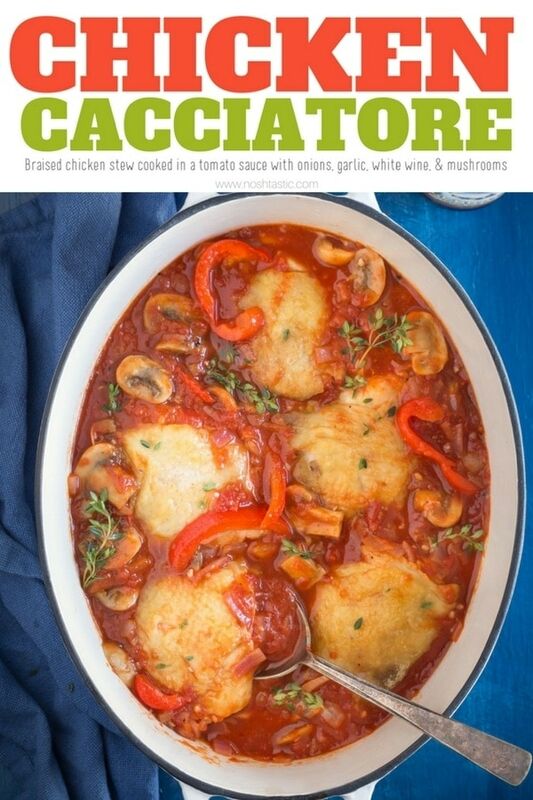 What do you serve with chicken cacciatore? We prefer to serve Chicken Cacciatore over rice to soak up the delicious sauce. You can also serve it over pasta noodles, polenta, or mashed potatoes, or simply serve it as it is with some steamed vegetables. What kind of wine goes with chicken cacciatore? I prefer to use a dry white wine to cook in this recipe such as a Pinot Grigio, Sauvignon Blanc, or Chardonnay. As a general rule it’s a good idea to serve the same wine with your chicken cacciatore as you used to cook in the tomato sauce. It also means you don’t need to open two different types of wine and is another good reason for avoiding cooking wines altogether and buying the real deal! 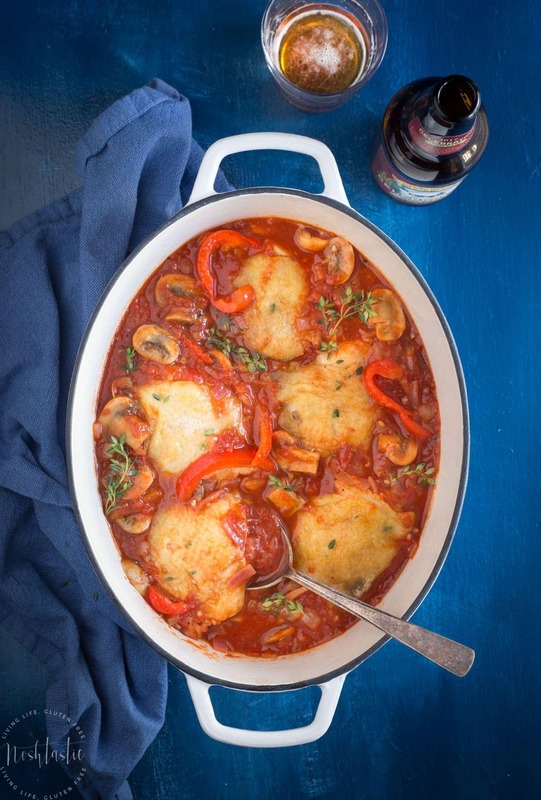 This is a quick and easy version of Chicken Cacciatore, also known as 'Hunter's Chicken'. Make it on the stove, in the oven, or in your crockpot or slow cooker. Season the chicken thighs both sides with salt and pepper. Add a little olive oil to a Dutch oven and gently cook them on a medium heat for about 4-5 minutes on each side to brown the chicken, then remove from pan. Heat a little more olive oil in your Dutch oven and saute the onions, red bell pepper, and garlic for about 4 minutes. Add the white wine, tomatoes, bay leaves and thyme to the vegetables and heat until the sauce is simmering. Now add mushrooms to the sauce along with the chicken pieces on top of the sauce, skin side up, and bake in the oven without a lid for about 35-40 minutes or until the chicken is fully cooked. Add a little olive oil to a skillet and gently cook the chicken pieces on a medium heat for about 4-5 minutes on each side to brown it, then remove and set aside. Heat a little more olive oil in your skillet and saute the onions, red bell pepper, and garlic for about 4 minutes. Add the onions, bell pepper, garlic, to the slow cooker along with the thyme and bay leaves. Pour over the white wine and tomatoes and stir. Now add the chicken pieces on top of the sauce, skin side up, and put the lid on and cook on high for 3-4 hours, or low for 6-8hrs or until cooked. Thirty minutes before the cook time is up, add the mushrooms to the slow cooker, stir and put the lid back on. yum!! new to your blog and I can’t wait to try this!! I have already printed out three of your recipes to try later this week! Hi Kim, I hope you’ll come back and tell me how the recipes went!